Kroonpark is a holiday resort on the banks of the Vals River. Here, amidst the green lawns and shady trees, one has a choice of fully furnished chalets, a caravan park and picnic sites. Its many features include an indoor heated swimming pool, outdoor swimming pool, a restaurant, conference facilities, a large amphitheatre, a boat, 18-hole putt-putt course, tennis courts, 18-hole golf course, trampolines, bumper boats and fishing. It is located at CorVandelinge Street, Kroonstad and can be contacted at tel. +27 (0)56 213 1942and fax+27 (0)56 213 194. Game reserve with 21 species of game and about 70 lions. Activities include game drives and viewing, lion breeding program, eco-reserve with clubhouse, restaurant, 4X4, motocross, horse riding, fishing, and caravans. The reserve can be contacted at tel. +27 (0)82 776 6779 or fax +27 (0)56 213 1493. Moratuwa Nature Reserve covers 1 500 hectare and is located in the greater Ghoya Conservancy. 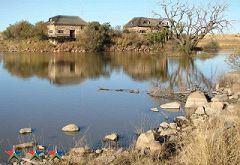 The Renoster River meanders for about 10km on the reserve on its way to join the Vals River near Kroonstad. Activities include game drives, wine tasting, hiking, birding, predator viewing and fishing. Conference facilities available for ± 50 persons and tea garden for ± 60. Moratuwa currently has 7 lodges and caters for groups of 2 to 20 guests. Moratuwa has 3 pubs situated at the restaurant in the entertainment area. The SarelCilliers Museum on the first floor of the Public Library, contains portraits and documents relating to the Cilliers family. There are also exhibitions on the gold mining industry and the development of the Free State railways. Tourism activities include Agricultural Exhibitions • Boating • Hunting and Game Drives/Viewing • Canoeing • Angling • Bird watching • 18 Hole Golf Course • Stud Farming • Evans Tractor Museum. Tourist information can be obtained at tel. (016) 970-8600. 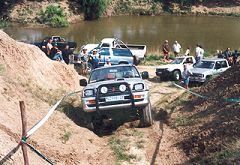 A 4X4 route for vehicles, motorbikes and mountain bikes.Fishing, swimming and clay pigeon shooting. Accommodation in a big stone building, 20 beds, kitchen with gas stove, fridge, braai accessories, 2 toilets, a shower (with hot water) using a ‘donkey’. Camping sites available without electricity. Other tourism activities include a well-known ceramics factory, 4×4 routes, game farming and hunting. Tourist information can be obtained at tel. (016) 970 8600.